When in 2002 André Matos split from Angra, taking along the skilled rhythm section composed of Luis Mariutti – bass and Ricardo Confesori – drums, planning to create a new band, my expectations were pretty low. Based on previous experiences, I was waiting for two things to happen with the separated parties: a) the remaining band strives to find a valuable replacement who (despite his talent) usually ends up being labeled an unworthy clone of the original vocalist or at least an unfit replacement, and b) the singer gathers a group of musicians around him and releases an album that either is a flawed copy of the previous band style or it’s basically a pretty much ‘vocal’ album with too little room for the instruments. Fortunately, this was not the case here, each half of Angra taking their own way and succeeding at creating (or consolidating) their sound. Angra were quick to find a very good voice (Eduardo Falaschi) and André Matos, having already the backbone of the band, didn’t have to look that far for a new guitar player. Hugo Mariutti rounded up the new Shaman line-up. The debut album released in 2002 – Ritual, though bearing some similarities to the Angra style was a very promising progressive album on its own. So, three years later we are presented with a follow-up together with a name-change due to copyright issues. Funny, now we have the new Shamaan band with its sophomore opus. The new album though still retains the classic progressive metal with ethnic motives sound is much more straightforward, more powerful, with more aggressive and heavy rhythms combined with warm keys and André’s unique voice. Let me say that I consider André to be one of the most gifted voices in the rock genre nowadays. Apart from a very original tone, he has excellent range and depth, being capable to display a wide range of emotions despite being more than often labeled as a ‘light’ voice. Also, his skills as a keyboard player increase the complexity of the arrangements on each song of the album. Right from the start of the album (Turn Away) you see the changes in the style, a power fast rhythm opening for Andre’s voice together with shredding keys. Good bass drive by Luis Mariutti defines this rather teutonic power song. Reason, the title song is one of the highlights of the album, with a slow start that builds up with André’s voice starting from the low tones up to the high ones with an excellent keyboard bridge to a crisp guitar solo. More is a Sisters Of Mercy cover, André matching the low tones of Andre Eldritch (vox for Sisters Of Mercy). Innocence is a laid back ballad, with a piano opening and the slightest native motive in the background reminding a little of the Angels Cry era, with excellent mid tempo guitar solo and a very emotional and open voice chorus. Scarred Forever is a very catchy song with playful guitar/keyboards dual rhythm. Good pace changes throughout the entire song with excellent drumming. In The Night is one of the most progressive songs of the album despite the standard structure, with aggressive guitars over backing native keyboards. Excellent chorus, with André showing his great volume in the mid range this time. Nice input of violin in the middle section of the song. Rough Stone is a quiet-starting song again Angra reminiscent, which quickly turns into well balanced, with excellent drumming crystal clear and varied, vocal led piece. The uplifting Iron Soul uses the Reason theme only to turn it into a very Iron Maiden heavy opening rhythm which develops into a complex song using a heavy metal rhythm, piano/keyboard alternation and melodic guitar solo. Trail Of Tears is the fastest song on the album, with the rhythm section right upfront, setting the pace for the aggressive yet warm vocals, André hitting efortlessly the high notes, with fast angry guitars. Odd keys part makes it a very intriguing song, speedish and colorful. Born To Be, the last song has again a good balance between the piano with warm vocals and good powerful guitar driven parts. The keys add a warm layer over the entire metallic side of the song. The final two minutes it’s just a piano dripping caressing notes over the spirit of the album. I know some of the fans will not be content with the direction the band has taken with this new album. 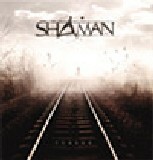 Still, I think that Shaaman (or Shaman for others) kept on growing as a band, reaching new styles, progressing and improving their sound. I can understand the desire to distance from the Angra based sound (hell, I must have said the word 'Angra' at least ten times in this review and it's a Shaaman album I'm reviewing) and trying to carve an original new one. I hope that they will keep releasing albums that makes you pay attention to. After all that’s what PROGRESSIVE is all about, right?